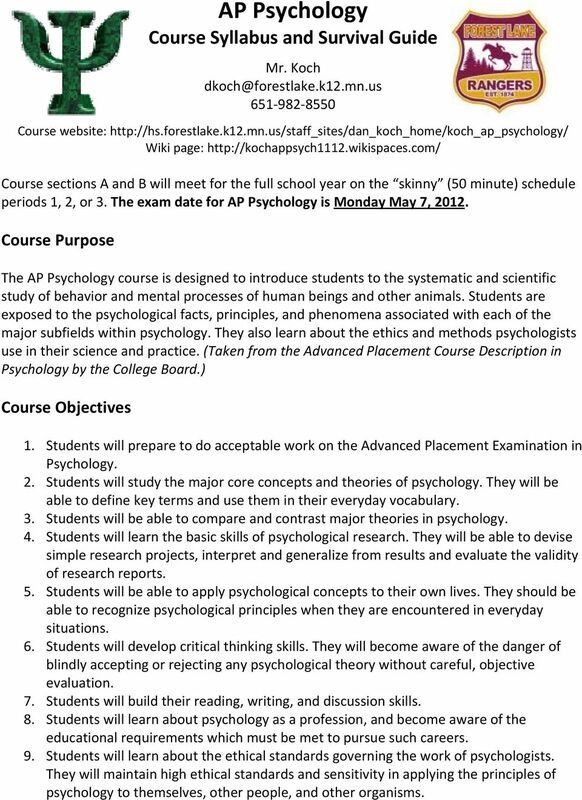 Download "AP Psychology Course Syllabus and Survival Guide"
1 AP Psychology Course Syllabus and Survival Guide Mr. Koch Course website: Wiki page: Course sections A and B will meet for the full school year on the skinny (50 minute) schedule periods 1, 2, or 3. The exam date for AP Psychology is Monday May 7, Course Purpose The AP Psychology course is designed to introduce students to the systematic and scientific study of behavior and mental processes of human beings and other animals. Students are exposed to the psychological facts, principles, and phenomena associated with each of the major subfields within psychology. They also learn about the ethics and methods psychologists use in their science and practice. (Taken from the Advanced Placement Course Description in Psychology by the College Board.) Course Objectives 1. Students will prepare to do acceptable work on the Advanced Placement Examination in Psychology. 2. Students will study the major core concepts and theories of psychology. They will be able to define key terms and use them in their everyday vocabulary. 3. Students will be able to compare and contrast major theories in psychology. 4. Students will learn the basic skills of psychological research. They will be able to devise simple research projects, interpret and generalize from results and evaluate the validity of research reports. 5. Students will be able to apply psychological concepts to their own lives. They should be able to recognize psychological principles when they are encountered in everyday situations. 6. Students will develop critical thinking skills. They will become aware of the danger of blindly accepting or rejecting any psychological theory without careful, objective evaluation. 7. Students will build their reading, writing, and discussion skills. 8. Students will learn about psychology as a profession, and become aware of the educational requirements which must be met to pursue such careers. 9. Students will learn about the ethical standards governing the work of psychologists. They will maintain high ethical standards and sensitivity in applying the principles of psychology to themselves, other people, and other organisms. 3 Questions to Think About Before We Begin 1. Why are you taking this class? Do you want to learn about psychology? Are you ready for a college level class? Are you serious about preparing for and taking the AP exam in May? Would the regular psychology class better suit your goals? 2. What are your priorities? Are academics near the top of the list, or are you more concerned with athletics, social life, a part time job, television, and so on? 3. How much time will you need to devote to this class? This will depend on your own strengths and weaknesses. A rule of thumb suggested by many colleges is to spend two to three hours working outside of class for every hour you spend in class. Since most college courses meet three hours a week, this translates to about six to nine out of class hours per week. Are you willing to make this commitment? 4. Are you a strong reader? In terms of course assignments, nothing will occupy more of your time than reading and studying the text. Research has shown that the strongest prediction of success in high school AP classes is reading ability. If you are a good reader, you have a distinct advantage. If you are not a good reader, know that it is going to require extra time and effort to compensate for that weakness. 5. What is your motivation level? Your level of motivation is much more important than your ability level. If you want to succeed in AP Psychology and you are willing to put in the necessary effort, you will succeed. Attitude, study skills, determination, and discipline count for more than intelligence toward your success in this class. After considering the above, if you have any questions, concerns, etc. as to whether AP Psychology is the course for you, please talk to me ASAP, preferably today! Grading Grades are based on a weighted point scale, wherein different categories of work account for set percentages of the overall grade. 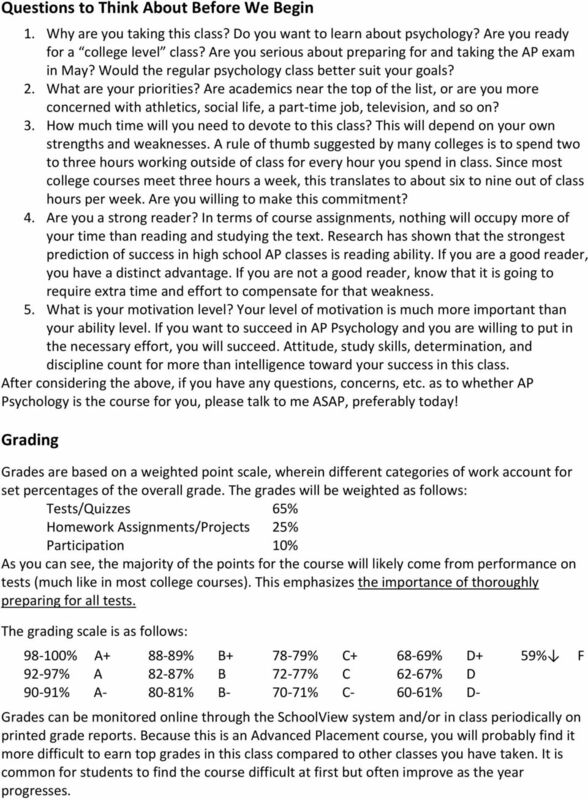 The grades will be weighted as follows: Tests/Quizzes 65% Homework Assignments/Projects 25% Participation 10% As you can see, the majority of the points for the course will likely come from performance on tests (much like in most college courses). This emphasizes the importance of thoroughly preparing for all tests. The grading scale is as follows: % A % B % C % D+ 59% F 92 97% A 82 87% B 72 77% C 62 67% D 90 91% A 80 81% B 70 71% C 60 61% D Grades can be monitored online through the SchoolView system and/or in class periodically on printed grade reports. Because this is an Advanced Placement course, you will probably find it more difficult to earn top grades in this class compared to other classes you have taken. It is common for students to find the course difficult at first but often improve as the year progresses. 4 Discussion/Participation Grade Discussion is an integral part of any psychology class. Included in each of the four quarters is a discussion/participation grade. The score for this part of the grade will be 10% of the weighted grade for the quarter. Class discussion, lab work, class work, video/computer days, and all other elements of class are included as part of the participation grade. 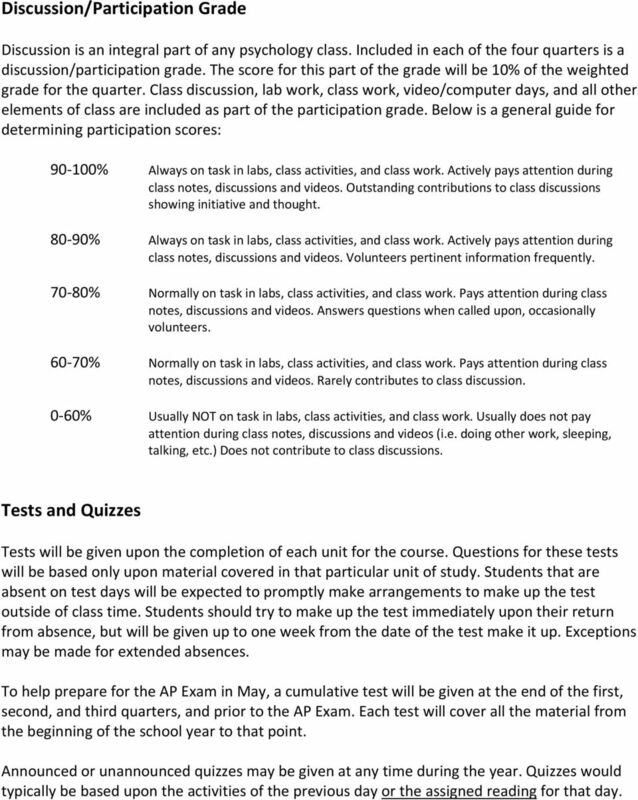 Below is a general guide for determining participation scores: % Always on task in labs, class activities, and class work. Actively pays attention during class notes, discussions and videos. Outstanding contributions to class discussions showing initiative and thought % Always on task in labs, class activities, and class work. Actively pays attention during class notes, discussions and videos. Volunteers pertinent information frequently % Normally on task in labs, class activities, and class work. Pays attention during class notes, discussions and videos. Answers questions when called upon, occasionally volunteers % Normally on task in labs, class activities, and class work. Pays attention during class notes, discussions and videos. Rarely contributes to class discussion. 0 60% Usually NOT on task in labs, class activities, and class work. Usually does not pay attention during class notes, discussions and videos (i.e. doing other work, sleeping, talking, etc.) Does not contribute to class discussions. Tests and Quizzes Tests will be given upon the completion of each unit for the course. Questions for these tests will be based only upon material covered in that particular unit of study. Students that are absent on test days will be expected to promptly make arrangements to make up the test outside of class time. Students should try to make up the test immediately upon their return from absence, but will be given up to one week from the date of the test make it up. Exceptions may be made for extended absences. To help prepare for the AP Exam in May, a cumulative test will be given at the end of the first, second, and third quarters, and prior to the AP Exam. Each test will cover all the material from the beginning of the school year to that point. Announced or unannounced quizzes may be given at any time during the year. Quizzes would typically be based upon the activities of the previous day or the assigned reading for that day. 5 Notebooks Each student is expected to have a notebook and bring it to class every day. Along with reading the textbook, taking notes will be one of the most important parts of learning psychology. The following are some tips for improving your note taking: 1. Take complete, dated class notes. (Documenting dates of notes will also help in sharing missed notes with classmates.) 2. Your notes should be more than just what items are listed on the blackboard or screen. 3. Put the notes in your own words. Don t write something you don t understand without asking about it. If you leave class with two pages of notes but no idea what any of it is about, what have you really gained? 4. Leave some blank spaces on each page to make additions and/or clarifications. 5. Review your class notes each day while they are fresh in your mind. Expand them, clarify them, and add examples so they will make sense when you go back to study them later. Note anything that doesn t make sense and ask questions in class the following day. 6. Before class look over the notes from the preceding class. This is especially important if a topic is presented over multiple days. 7. If you are absent on class note days, you are responsible for obtaining the notes from other students. 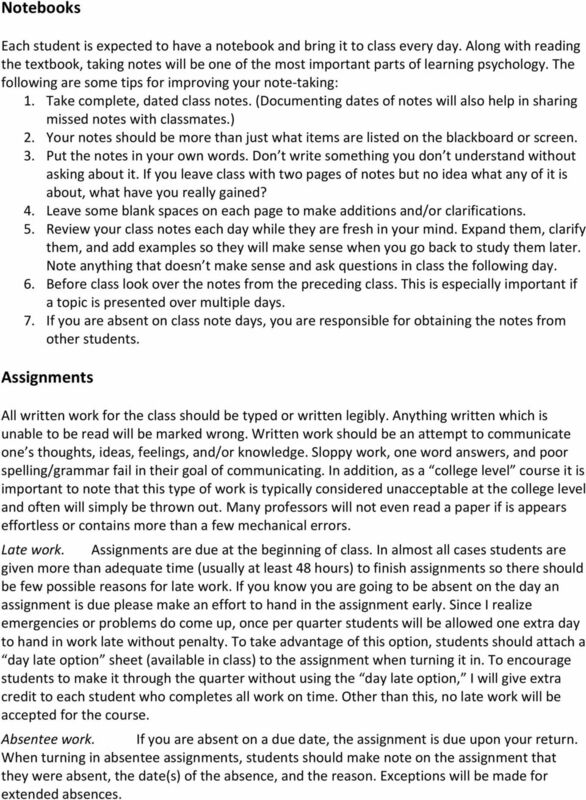 Assignments All written work for the class should be typed or written legibly. Anything written which is unable to be read will be marked wrong. Written work should be an attempt to communicate one s thoughts, ideas, feelings, and/or knowledge. Sloppy work, one word answers, and poor spelling/grammar fail in their goal of communicating. In addition, as a college level course it is important to note that this type of work is typically considered unacceptable at the college level and often will simply be thrown out. Many professors will not even read a paper if is appears effortless or contains more than a few mechanical errors. Late work. Assignments are due at the beginning of class. In almost all cases students are given more than adequate time (usually at least 48 hours) to finish assignments so there should be few possible reasons for late work. If you know you are going to be absent on the day an assignment is due please make an effort to hand in the assignment early. Since I realize emergencies or problems do come up, once per quarter students will be allowed one extra day to hand in work late without penalty. To take advantage of this option, students should attach a day late option sheet (available in class) to the assignment when turning it in. To encourage students to make it through the quarter without using the day late option, I will give extra credit to each student who completes all work on time. Other than this, no late work will be accepted for the course. Absentee work. 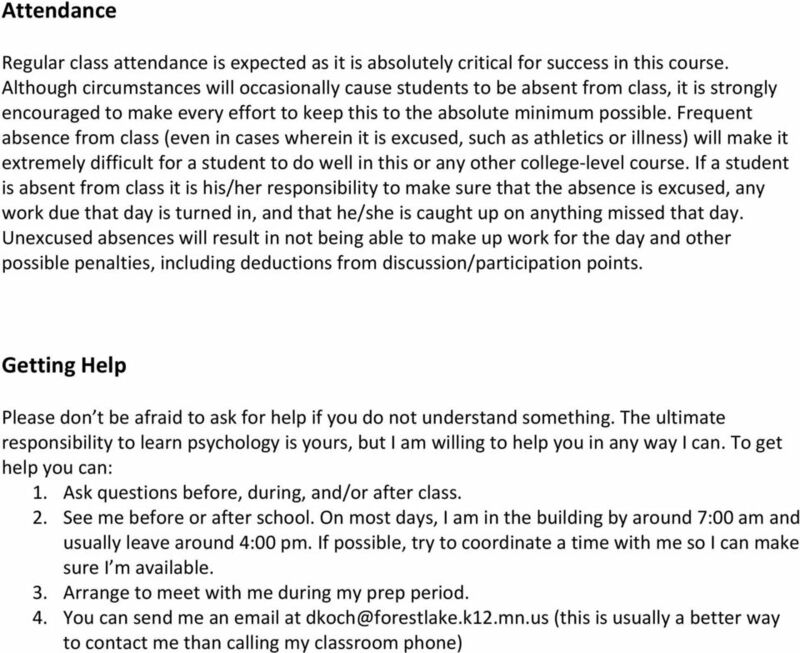 If you are absent on a due date, the assignment is due upon your return. When turning in absentee assignments, students should make note on the assignment that they were absent, the date(s) of the absence, and the reason. Exceptions will be made for extended absences. 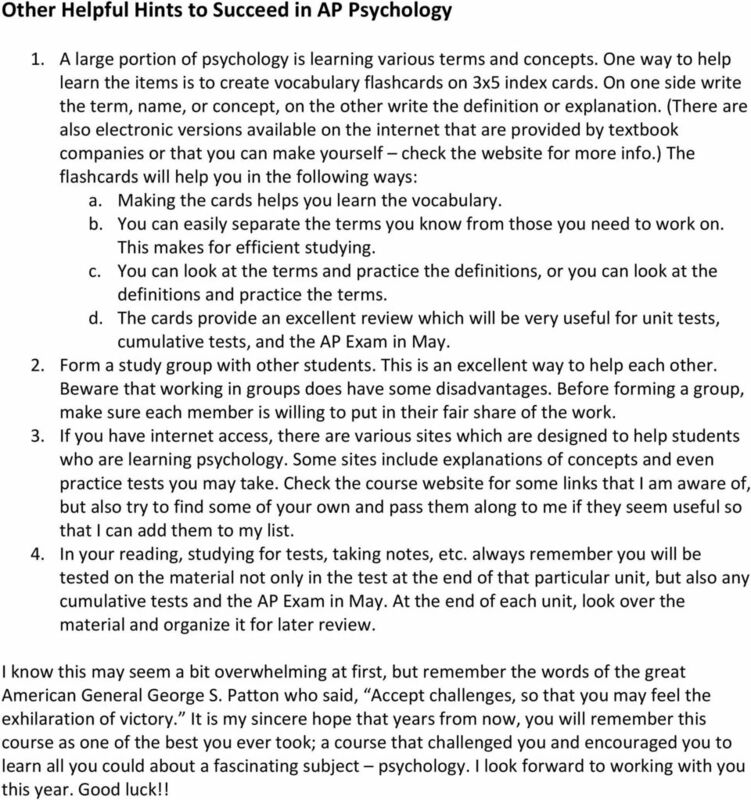 7 Other Helpful Hints to Succeed in AP Psychology 1. A large portion of psychology is learning various terms and concepts. One way to help learn the items is to create vocabulary flashcards on 3x5 index cards. On one side write the term, name, or concept, on the other write the definition or explanation. (There are also electronic versions available on the internet that are provided by textbook companies or that you can make yourself check the website for more info.) The flashcards will help you in the following ways: a. Making the cards helps you learn the vocabulary. b. You can easily separate the terms you know from those you need to work on. This makes for efficient studying. c. You can look at the terms and practice the definitions, or you can look at the definitions and practice the terms. d. The cards provide an excellent review which will be very useful for unit tests, cumulative tests, and the AP Exam in May. 2. Form a study group with other students. This is an excellent way to help each other. Beware that working in groups does have some disadvantages. Before forming a group, make sure each member is willing to put in their fair share of the work. 3. If you have internet access, there are various sites which are designed to help students who are learning psychology. Some sites include explanations of concepts and even practice tests you may take. Check the course website for some links that I am aware of, but also try to find some of your own and pass them along to me if they seem useful so that I can add them to my list. 4. In your reading, studying for tests, taking notes, etc. always remember you will be tested on the material not only in the test at the end of that particular unit, but also any cumulative tests and the AP Exam in May. At the end of each unit, look over the material and organize it for later review. I know this may seem a bit overwhelming at first, but remember the words of the great American General George S. Patton who said, Accept challenges, so that you may feel the exhilaration of victory. It is my sincere hope that years from now, you will remember this course as one of the best you ever took; a course that challenged you and encouraged you to learn all you could about a fascinating subject psychology. I look forward to working with you this year. Good luck!! If you do not already have an account, then make one. Use the code qpdesc to add my class. 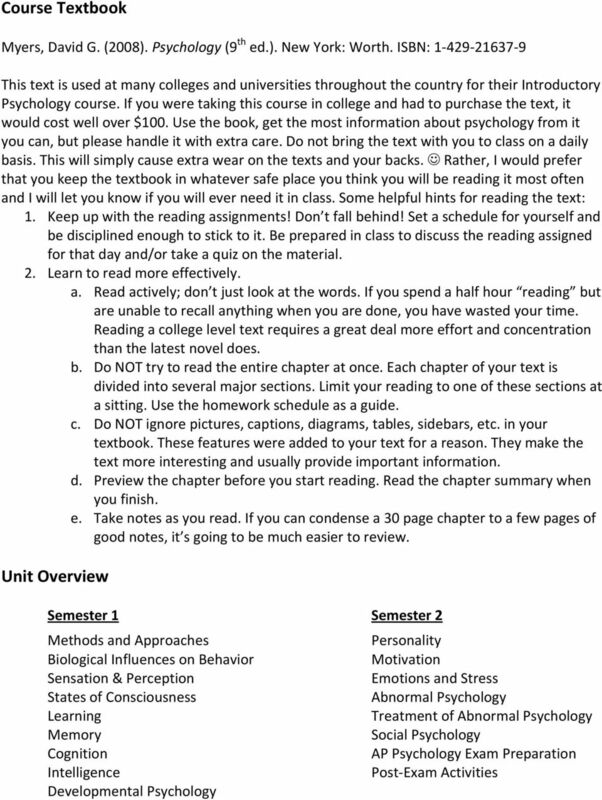 Introduction to General Psychology Spring 2014 PSY 1101-03, 30013 Mon. & Wed.: 6-7:15 Instructor: Jen Wallin-Ruschman Office Hours in Bowen 216: Mon., Wed., & Fri. 1-2; Mon. & Wed. 3:15-5; Tues. & Thur. Page 1 LaGuardia Community College City University of New York Social Science Department General Psychology: SSY 101 2604 COURSE INFORMATION PROFESSSOR INFORMATION Semester: Spring 2012 Professor: Prof.
PSYC 5: GENERAL PSYCHOLOGY (ONLINE) El Camino College Section 4195, Spring 2010. Professor: Amy Himsel, Ph.D.
Medical Biochemistry BC 362 Fall 2014 Instructor: Julie Millard, Dorros Professor of Life Sciences Keyes 304, 859-5757; jtmillar@colby.edu Office hours: As announced in class each week and also by appointment. Welcome to the Test Strategies Module.